There is a Hayagriva Sannadhi at Aaushadagiri hillock where Swami Desika worshipped Garuda and Hayagriva. Lord Hayagriva appeared and blessed Swami Desika. There is a Sannadhi for Swami Desika in the temple. The Theerthavari and Malai uthsavam during purattasai (Sept - Oct) are important festivals. As this sthala was conceived and constructed by Adisesha, the place is called Tiru Aheendrapuram. Garuda and Adisesha brought the Vraja (Garudanadhi) and Patala Ganga (Sesha) Theerthams for the Lord and are used for Abhishek and for making Prasadams respectively. There is also a sanctum sanctorum for Lord Hayagreeva. One can see a lotus in the hands of the Utsavar, eyes over the forehead, 'jada'(long hair) over the head and the usual shanku and the chakra. These are considered to be the symbols for the Trimurthy. The temple is accessible from Thiruppappuliyur station(about 3 miles westward). The town has a good frequency of buses. Bus facility available from Trichy. This is on the way from Trichy to Thuraiyur. 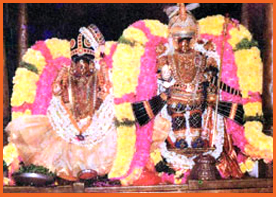 This Divyadesam is one of the main sthalam in Nadu Naattu Divyadesam. The temple is situated about 5 Kms away from Cuddalore in South Arcot District,Tamil Nadu. This temple is located underneath a small mountain (Malai Adivaram). 3 miles away from Tirupathirippuliyoor railway station which is in between Chennai - Trichy railway lane. Bus facility is also available.